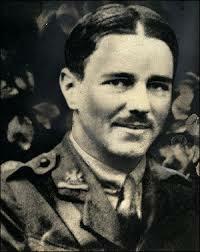 The gifted young poet Wilfred Owen joined World War I with the Manchester regiment in 1916, on the Somme sector of the Western Front. This was no action-packed battlefield, but (as C. Day Lewis described it) “a desolate landscape of trenches, craters, barbed wire, ruined buildings, splintered trees, mud, the corpses of animals and men.” Invalided out, Owen wound up at Craiglockhart War Hospital in Edinburgh, where he became friends with the older and better-known poet Siegfried Sassoon. Their mutual horror at the glamorizing deception that had lured the best and brightest of their generation into this nightmare produced a staggering body of poetry, but did not stop Owen from returning to active duty in France. He was killed in action on November 4, 2018, a week before Armistice Day.